This is NOT a northeastern Chinese recipe. :) A friend of mine asked for this recipe a while back, but, well, firstly, I am lazy to try new things, and I wouldn’t put anything here if did not try to make it and take the actual pictures. Secondly, I have never been a good ‘baker’, I can never carefully check the weight / proportions of each ingredient, which is actually quite crucial for making this kind of food. Anyway, I did try to ‘behave’ well this time. my ‘Western’ friends for Dimsim, steamed creamy custard bun is almost ‘default’ order. 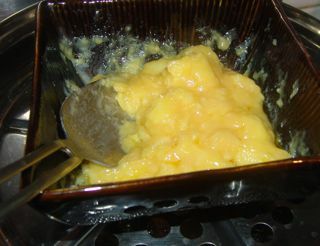 Creamy custard bun in Mandarin is called ‘Nai huang bao’, as in ‘custard’ bread. It is normally steamed, but it can also be fried (after steaming), then you would get ‘crispy’ skin and soft ‘bread’ underneath and smooth (even a bit ‘liquid-ish’ centre. It was introduced to northern China by mid 1990s; suddenly Cantonese Dimsim became such a trendy thing. However, northeast people were more curious about the food rather than the actual Cantonese custom of having 4-5 meals per day; Dimsim plays an important part in this way of eating, especially for late dinner. 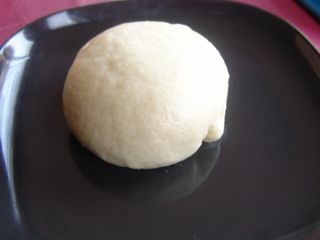 Steamed Creamy Custard Bun is very similar to Mantou (steamed Chinese bread) in Northern China, but with cream custard filling, and ‘sweet-ish’ pastry ‘sheet’. Ok, here is the recipe. There are many different way of making it, but the essential part is always more or less the same. Flour (I used extra sifted flour, for that ‘smooth’ and ‘white’ appearance). Mix around 200g flour with 120ml coconut milk, 3g fast baking yeast, 8g white sugar together, and knead it into a dough, then let it rise up for 1 1/2 or 2 hours. 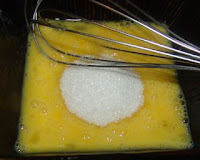 1) Beat two eggs in a bowl, then add in the sugar. 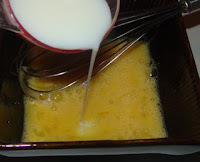 2) When the sugar is completely ‘melting’ in the eggs, add in 100ml milk. 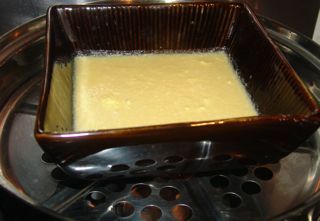 3) Sieve the mix for removing any impurities. 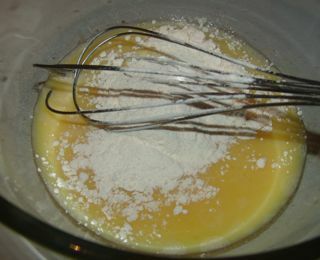 4) Add in around 50g of flour, mix well. 5) Then add in 50g butter. Mix well. 6) Place the mix in the steamer, to steam for 15 minutes, with every 5 minutes make a ‘stir’. 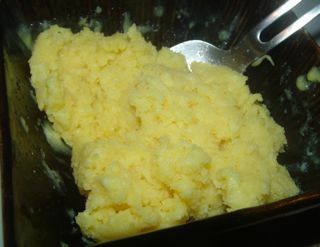 Then the centre filling turns into a ‘solid’ form. 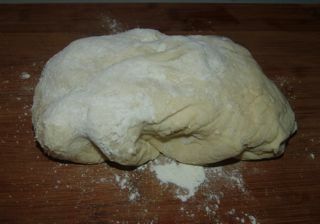 Allow it cools down, ‘kneading’ it until it turns into a smooth paste. 1) Evenly divide the flour dough and the filling. 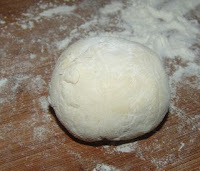 2) Roll the flour dough into around 10cm diameter and 0.6cm thick round ‘sheet’. 3) Shape divide filling into a round ‘ball’, and place in the middle of the pastry sheet. 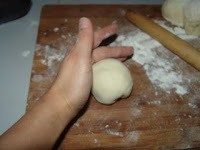 4) ‘Wrap’ up the pasty sheet, tight up at the centre. Then turn it over, place it on the board shape it well. I cannot believe that I made it! It did look and taste like the real thing!! :))))) Although it could have been more sweeter, oh, well, ‘he’ is not a big fan of sweets, so this makes it perfect. :)) But if you like it more sweeter, add more sugar than suggested amount. :) Enjoy!! Mix 200g flour with 120ml coconut milk, 3g fast baking yeast, 8g white sugar together, and knead it into a dough, then let it rise up for 1½ or 2 hours. Beat two eggs in a bowl, then add in the sugar. 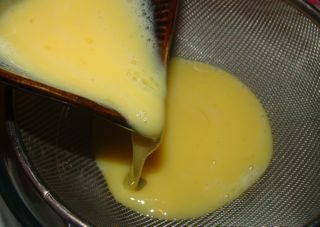 Sieve the mix for removing any impurities. Add in 50g of flour, mix well. 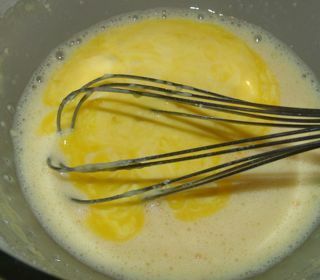 Add in 50g butter. Mix well. 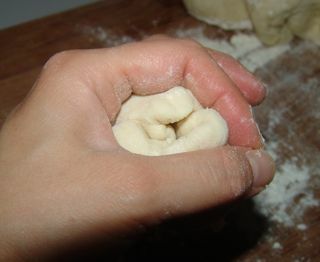 Evenly divide the flour dough and the filling. Roll the flour dough into around 10cm diameter and 0.6cm thick round sheet. 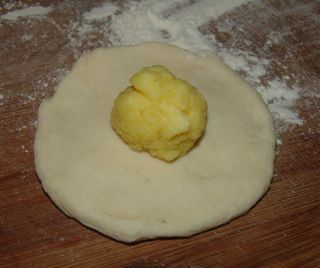 Shape divide filling into a round ‘ball’, and place in the middle of the pastry sheet. Wrap up the pasty sheet, tight up at the centre. Then turn it over, place it on the board shape it well. 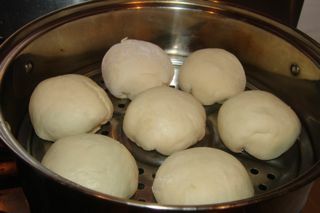 Place it in the steamer, cover the lid for further 15 minutes before steaming, for the flour paste raising up again.